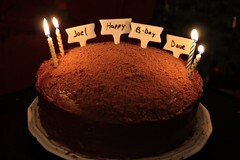 On Sunday, some of my friends got together to celebrate me and my friend, Dave’s, birthdays. We first had brunch at Boulevard Cafe in Daly City, where we open some of our gifts. Howard and Bill got me more of the blue glass stones from Ikea. I also got some gift cards from Lutz and Dave and a picture frame from Wincy and Jeremy. Thanks everyone! 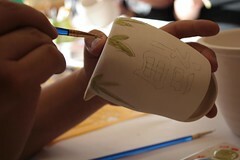 Afterwards, we went over to Color Me Mine and painted some pottery. I didn’t even know that this kind of shop existed. 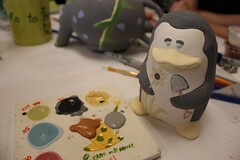 I choose a penguin container and a pot to paint. This was my first time doing this, so it took me a while to finish… I think it took me more than three hours to paint them. As I was painting, Wendy helped me take some photos. This entry was posted in Uncategorized and tagged birthday, blue glass stones, color me mine, dave, flickr, friends, pottery. Bookmark the permalink.